I prefer to build my own canvas stretchers. You can certainly buy not only canvases pre stretched and gessoed, but also pre made canvas stretchers that are good quality and reasonably priced. I was taught to build them not only because they are much more economic, but there is something about building the whole thing and adding your work to the surface that is not only gratifying, but makes the work much more personal. I have also found that the pre stretched and gessoed canvases can have an odd surface and the canvas doesn’t seem like it is stretched tight enough for me. 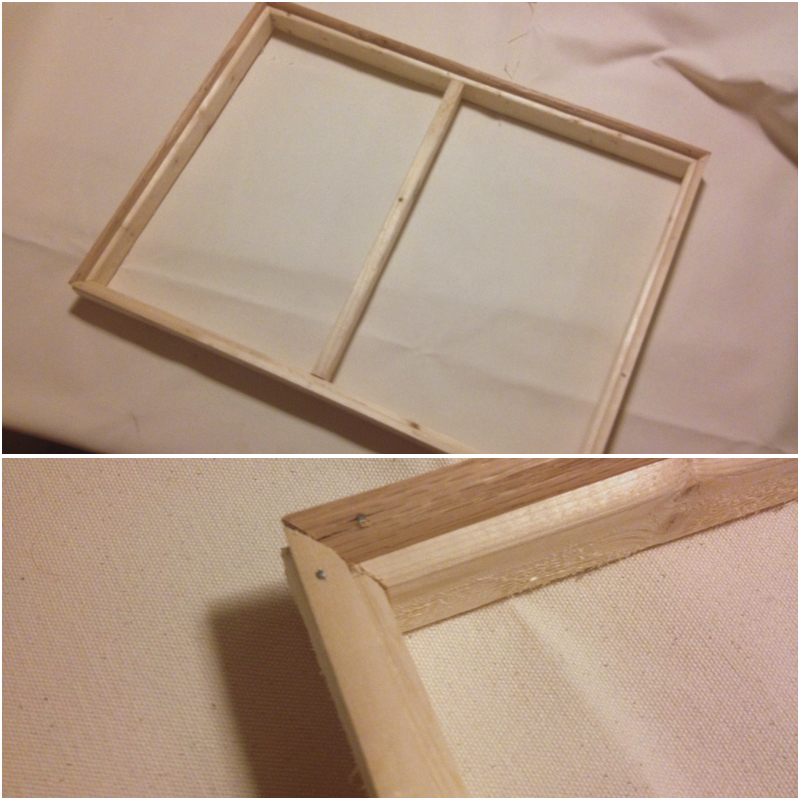 I’m not a carpenter, and this frame is not perfect… but what I’m going for is a clean edge to stretch the canvas around. This is simply 1” x 2” lumber, 1/2” quarter round (moulding) and nails (1” & 2” finishing nails). I miter the corners and use at least one middle support depending on the size. This one is 18” x 24” and I’m just using it as warm up for a much larger piece. As this is on the smaller side (for me), I’m not going to glue the joints. I’m using 15oz. canvas. I don’t like it too heavy or too thin. 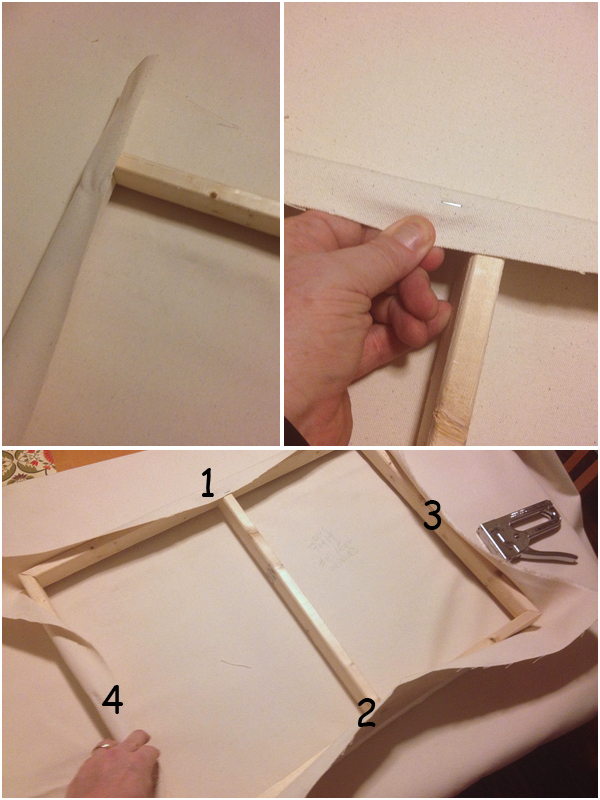 I cut a piece of canvas that overlaps to the back of the frame. 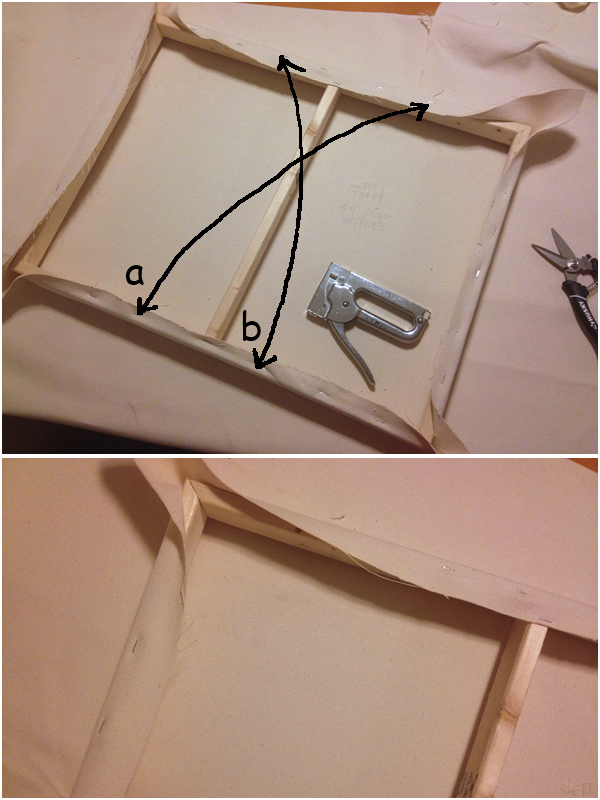 The sides of the frame will be raw canvas and the I’ll staple the back. (I find canvases stapled on the sides sometimes pucker.) I start by stapling in the CENTER of the frame (1 – I start on a long side), then I stretch the canvas across from (2) and staple. ALWAYS STRETCH LIKE THIS so that the fabric stretches from the center out. 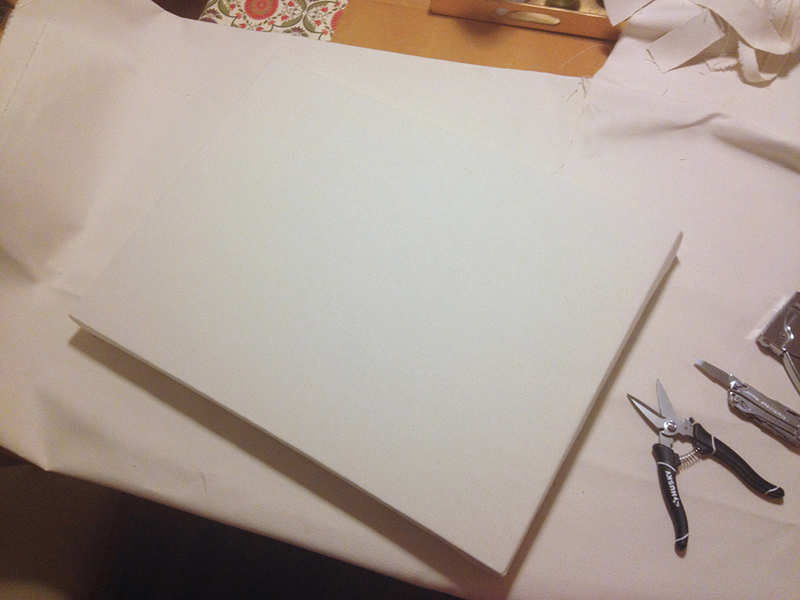 I then do the shorter sides (3, then 4), each time I’m pulling the canvas as taught as possible. (There are canvas stretching pliers that you can buy, but I find them a bit cumbersome). Next, I trimmed off some excess canvas after the first four staples. I then continue to staple moving from the center out and always placing an opposite staple (a & b). I then do the same thing on the short side, then back to the long side until I’m a few inches from each corner. Now for the corners… As you can see from the image above, you have a fair amount of extra fabric. Simply take one side and tuck it around the corner (1 – I use my Leatherman to help). 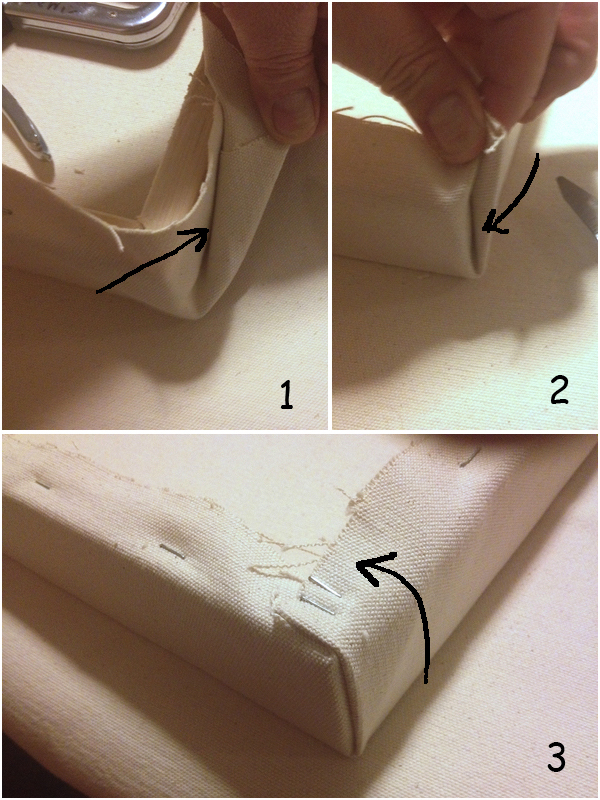 Then just cover what you’ve tucked in so you get a nice seam on the corner (2) . Stretch the canvas out towards the corner and over and staple (3). Repeat for the other 3 corners. Then go back and add some staples where the canvas seems loose, always pulling out from the center. Here is the finished stretched canvas, still raw. I will then do two coats of gesso (1 vertical, 1 horizontal), letting the first completely dry. The two coats done like this will fill in any streaks by the gesso brush as well as stretching the canvas tighter. Fascinating. I love these posts because I know nothing about the subject. Very cool.